Come out to Maker Faire 2018 for the best and freshest maker goodness and see what has become of the original Maker Faire after over 10 years in action. I’ll be there with Steadcraft, where you can see my latest designs–wearables inspired by vintage fashion and crafted with a hybrid of digital and manual techniques. Capitol Theater. What a looker. I couldn’t stop snapping shots. I’ve updated the gallery from my last post with a bunch more images. Hurry and glom a seat–the curtain is about to go up! It’s a challenge to credit a big job like this–please be patient as I document and attribute. I retain photo copyright but give permission to publish with the following attribution: “Capitol Theater: Five Ton Crane (or properly credited individual artist); Photography: Grant Diffendaffer.” Thank you. Over 60 artists contributed to this project. Kudos to all. If there was something subversive about this show I’d have to say that one element is the exhibition of a collaborative work of art that makes no particular effort to call attention to the individual artists. There are no little number stickers with a matching placard on the wall. The answers you are looking for come out of the art itself. That became apparent to me looking at this display of film reels, which happened to be in a glass museum case outside of the theater. Extra special thanks goes to Lead Artists Bree Hylkema and Sean Orlando, Lead Fabricators Jay Kravitz, Clifford Florio and Stephanie Shipman, who put in hours daily for the 10 (short ?!?) weeks it took to build this. Multiple artists helmed major individual projects. To name a few of those: Mural painting and gold leaf–Tania Seabock; Marquis paintings of Crocodile and Swan–Imogen Speer; Concession Stand–Derrick Gomez; Candy–Mike Woolsen and Katie Keech; Movie Directore–Allen White; Choreography and Dance–Jody Power; Poster Design; Jay Kravitz and Becca Henry, Dashboard; Michael Sturtz; Hood Ornament–Jo Slota… It might not be possible to de-construct art like this by simply listing constituent elements and tying them to names, but there are names behind its construction and they all deserve to be in the Smithsonian. I’m fresh back from Washington D.C., where I attended several days of festivities for the opening of “No Spectators: The Art of Burning Man.” An incredible time was had by all. If you read my last post, you know that my creative colleagues in Five Ton Crane debuted our latest work there. It’s called the Capitol Theater. It was commissioned for the event and built from scratch (not a modified vehicle), in just ten short weeks. If I may say so myself, it’s beautiful. As a team, we made everything right down to the black and white movies. 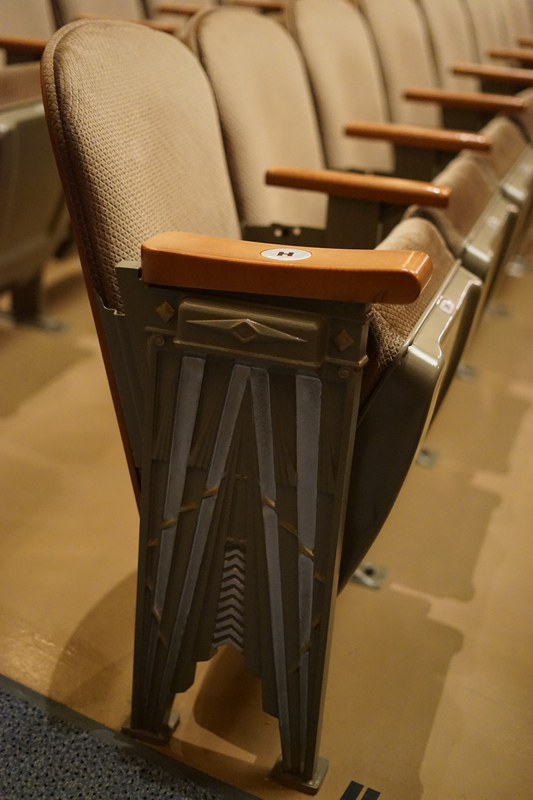 I myself designed the decorative steel end-caps on the end of each row of theater seats. I also laid much of the tile floor and contributed with a few carpentry odds and ends. The seats are my pride and joy though–drafted in Rhino and laser cut from 1/8″ steel. Enjoy the photos. If you can make it to D.C. by September, I highly recommend the show. It is free to visit and extends into the surrounding neighborhoods, helping make it the largest ever show put on by the museum. The museum itself is beautiful too, and has the distinction of being the first building in the country built for the purpose of art exhibition. Grill by Sean Orlando, Hood ornament by Jo Slota. Kokolores Movie Poster. By Jay Kravitz and Becca Henry. Kokolores still. Choreography by Jodi Power. Concession Stand. Case by Derrick Gomez, candy by Mike Woolson. Concession stand by Derrick Gomez. Photo of the artist. Candy by Mike Woolson. Newspaper by Heather Smith and Audrey Nieh. Tile Design by Bree Hylkema. Handiwork by Grant Diffendaffer, Ake & Leslie Grunditz and team). Ticket Booth Steps by Clifford Florio and Stephanie Shipman. V.I.P. Entrance by Clifford Florio. Laser cut steel and powder coat. Grill by Sean Orlando, Hood Ornament by Jo Slota, Poster by Imogen Speer.